It was bound to happen! I was doing so well wasn't I? But budgets are meant to be broken...no? I might of known I would be powerless to turn my back on a bargain and my challenge would go out of the window because of a discount! That's the best excuse I can come up with in my defence anyway! Although I have just flogged a load of stuff on EBay and have netted myself just over 200 quid so you could say I was looking for trouble! Any more justification needed?! So what was it that tipped me over the edge?? There was in fact one wish list item that I was waiting (with baited breath) for November 1st to roll around so that I could buy! 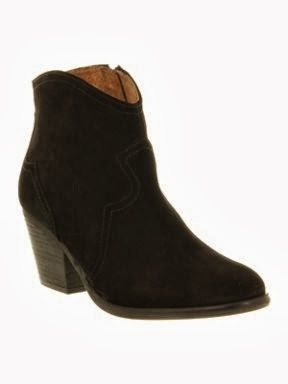 I have been trying to hunt down the the perfect pair of black boots (having just sold......ahem! 2 not so perfect pairs)! What I really wanted was a pair of Ash Jalouse but my 100 quid per month budget was not gonna stretch to those! I did a bit of research and well......it lead me to these from Office called Untouchable! And what luck that a voucher for 25% off just happened to pop up in Grazia this week! Who on earth in their right mind would be able to pass up on an offer like that if you were planning on buying them anyway!! See......I said powerless! These are a brilliant homage to the Ash boots and with discount a great price at £51. I've gone over budget by £28. Not too bad really for the first month of the challenge and let's face it, there are only another 4 days of October left anyway and I've managed to fill another gaping black boot shaped hole in my footwear department! I promise to do better next month which shouldn't be so hard now as I have a little more than I expected as I had thought I'd be paying the full price of £68 for the boots thus eating up the best part of the £100! Now, November could prove to be a tricky month as we have a Christening so I am going to have to get seriously creative in the closet! As you will know if you have read some of my previous posts I am not a fan of buying dressier clothing that will only end up languishing in the back of the wardrobe! I won't be using what precious little I have to last me through the month on buying something new just for this occasion! But I would like to try and find something to update an outfit and to possibly carry me through the festive party season. Any ideas from you as to what to go for would be gratefully appreciated! What would you wear to a November Christening? I don't want to go too formal but I think it is an occasion where I need to look smart so I've been thinking jacket and heels or boots.......can you get away with trousers do you think? Well here goes anyway.....new mission set, it is now back to the pin board for me to glean some more inspiration! Just a couple of outfits from the past few days to share! Have a Saturday evening look to show! Another tricky scenario to dress for as it was a house warming for our lovely new neighbours....what to wear?? I was trying to decide what to go for with a fuzzy head.....the starting of a cold! Went with my new boots from Office with Dorothy Perkins coated jeggings, Topshop cami, Zara jacket and New Look necklace. Onto Sunday's outfits.....all about comfort. Luckily no sore head......I'm proud of myself for pacing it with the vino but I could have done with some matchsticks as we ended up rolling in at 4am again! Yawn! Donning my Topshop parka, H&M sweater and scarf, Gap outlet skinny's and Steve Madden boots. What have I got in store next for you? Well I may have a little print themed Christmas wishlist on the go.....I'm trying to make things easy for the DH so it's a one stop shop! Can you guess where?? Not my usual stomping ground just to give you a clue but I have found some fab pressie ideas to tantalise myself with! Love those boots Michelle, a great find. Hmmm a November christening - that's a difficult one. I know you have some gorgeous vintage dresses but I'm guessing they are too summery. How about that pale pink Zara jacket (bargain) with charcoal grey underneath??? Great tonal look for a soft and pale pink is big this year. I want that H&M scarf - didn't see it in that colour way. Got the burgundy one and it's such good quality. I really love your grey Zara long jacket - stunning! Actually could you not work this for the christening with a column of colour underneath eg top and trousers in winter white? Can't wait to see what you decide on. Thanks Donna for coming up with some great Christening ideas.....feel a trying on session will be in order the minute I get a chance as you have given me lots of food for thought! The pink Zara jacket is such a bargain......will I be able to resist it? I fear my budget may not fare any better in November at this rate! Love the new boots and seriously love the outfit you wore to your neighbours drinks party. I've never seen that Zara jacket worn so well!